Camping can be a fun-filled exciting family adventure or a difficult night’s sleep. For someone who hasn’t camped before it can seem like a daunting experience. So here’s a list of things to carry to make your first night out under the stars a magical experience. Tent : A tent protects you from the natural elements while you sleep, you could opt for a one, two, three man or larger tent based on how many people you camp with. I’d say opt for one size larger than you need to just to make sure you have enough room to avoid being all up in someone else sleeping business — it’s fine with your significant other but may not go down well with your other camping buddies! You will need a dome type tent with enough ventilation and a bug screen, it works well in most of India. You may require better insulation for colder temperatures though. Tarp : A tarpaulin or a thick plastic sheet can be used to create a layer under the tent to avoid the tent floor from being ripped by stones or twigs. This can prove to be a life saver especially while camping in rains or on a damp surface. Sleeping bag : A sleeping bag provides you with insulation during the night, couple that with a yoga mat underneath so that you get an even and relatively soft surface to sleep on. Sleeping bags are usually rated by their insulation capability, when a bag is described as a “20-degree bag,” it means that most users should remain comfortable if the air temperature drops no lower than 20°F. These ratings assume that the sleeper is wearing a layer of long underwear and using a sleeping pad under the bag. Head lamp : A decent headlamp is an absolute must while camping, whether its to find a place to answer natures call at night or your car keys everyone should have one handy. Shoes : A pair of good walking shoes or hiking ones are good to keep on while up and about the campsite. You’ll thank me when stepping on a sharp twig or a stone. Lantern : LED ones are cheap, bright and easy to use. Bonus points for packing a little rope so you can hang it from a tree. The campfire may provide enough ambient light but a lantern will come of use inside the tent as well. Sunscreen : Wherever you’re going, whenever the time of year, pack a big ol’ tube of SPF50. You’re going to be outside, in the sun for a long time. Bug Spray : Unless you’re camping indoors there will be bugs. So be prepared with a bottle of Odomos Natural spray as it’s gentle on your skin and tough on bugs. First Aid kit : Preparing food and walking around in the dark, going hiking and just being outside, you’re going to get scrapes, cuts, blisters and whatnot. Make your own first aid kit tailored to your individual needs. Some things to include: Betadine, Dettol, Cotton swabs, paracetamol and some band aids. 10. 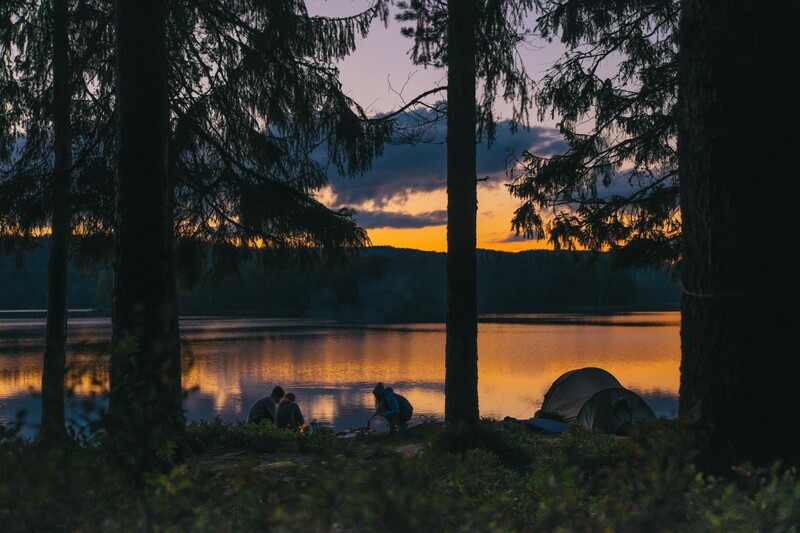 Trashbag : Once you’re through with camping the night it’s good camping etiquette to gather all your trash in a trashbag and either have it disposed at a designated trashcan or carry it home with you to dispose. Leaving no trace allows the next camper to enjoy the campsite as much as you did. Be sure to set up camp early and sit back to enjoy the sunset and the stars. Start off with a one day camping and then extend your trips as you get better at planning your equipment and keep growing from there. Rest be assured you’re going to hit some camping bumps but that’s the whole fun of camping learning experience!